Hey there Paper Peeps! 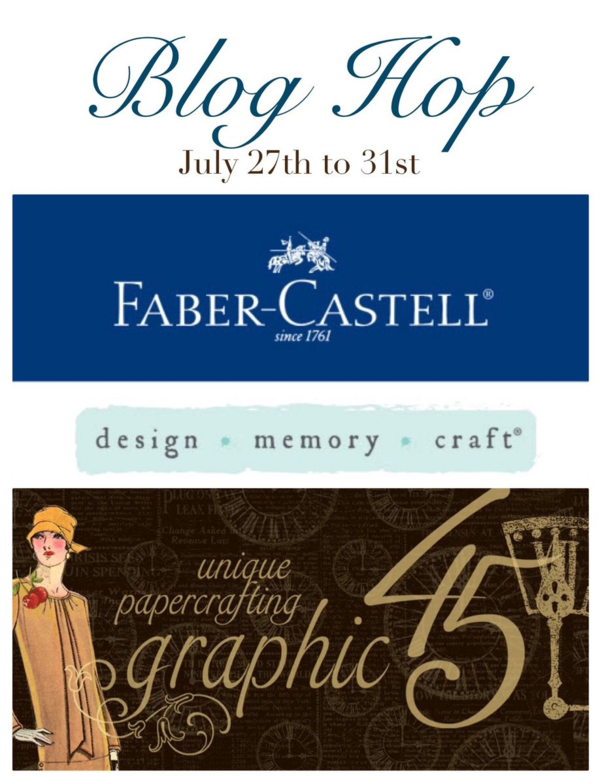 I’m so very excited to share that we are on day 4 of the Graphic 45 ~ Faber Castell Blog Hop! This was such a fun challenge for me. I’ve never used Gelatos before. 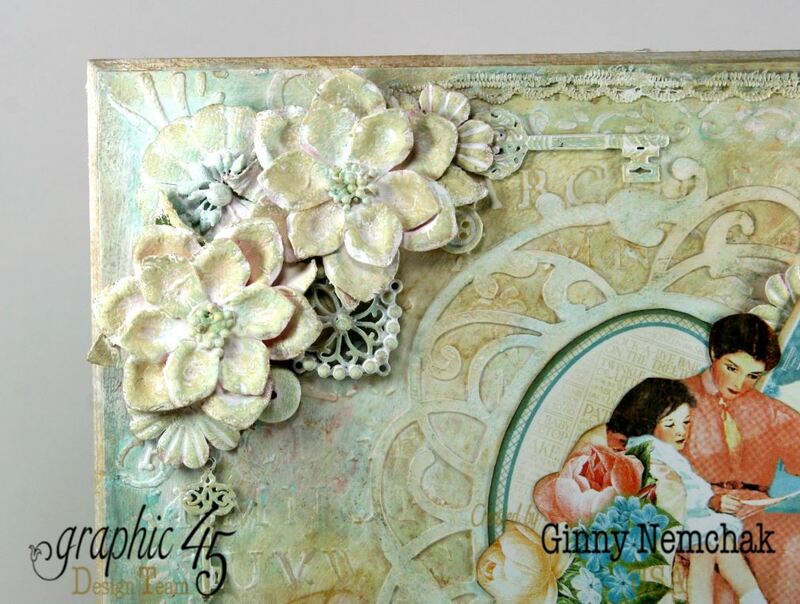 It took a little getting used to…but once I did I used it on everything even the flowers and metal embellishments. 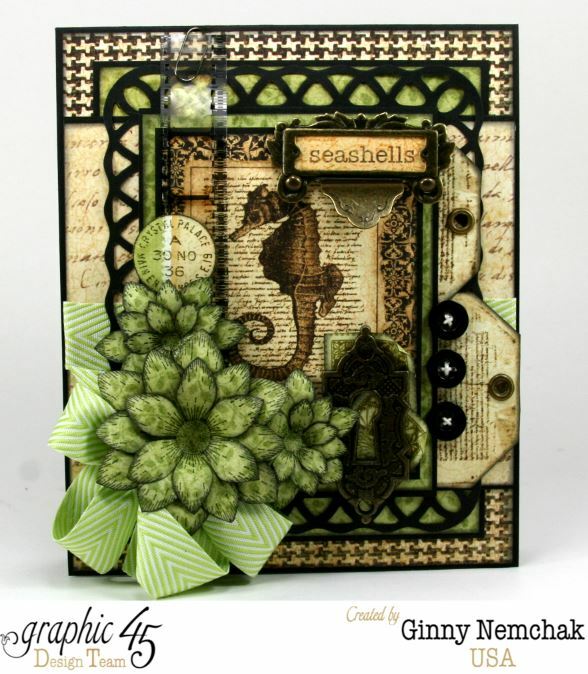 The whipped Spackle was my favorite part..thankfully I had some stencils in my stash so I was able to add loads of background texture and interest as a base for the fussy cut paper images. 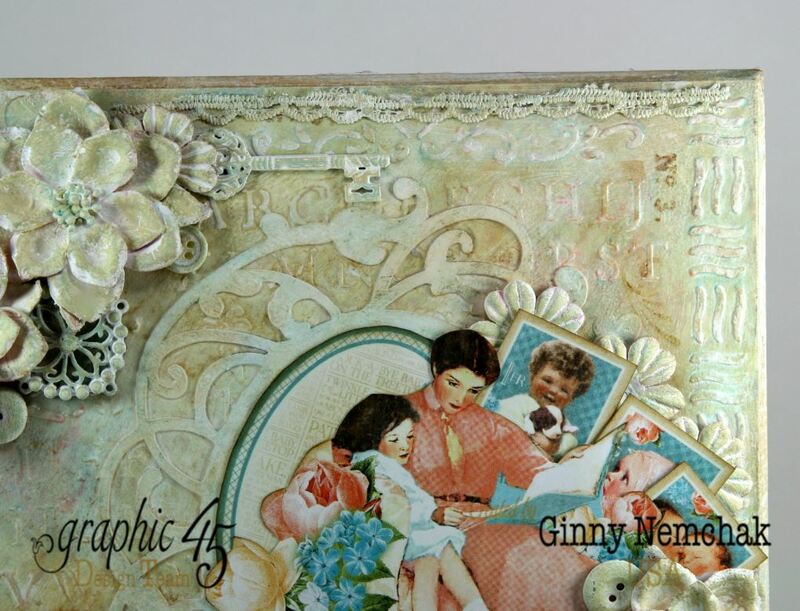 I think this little plaque is just dreamy with it’s soft muted colors and sweet children images. I’ll be using Gelatos on everything now..thanks for the inspiration to try something new! 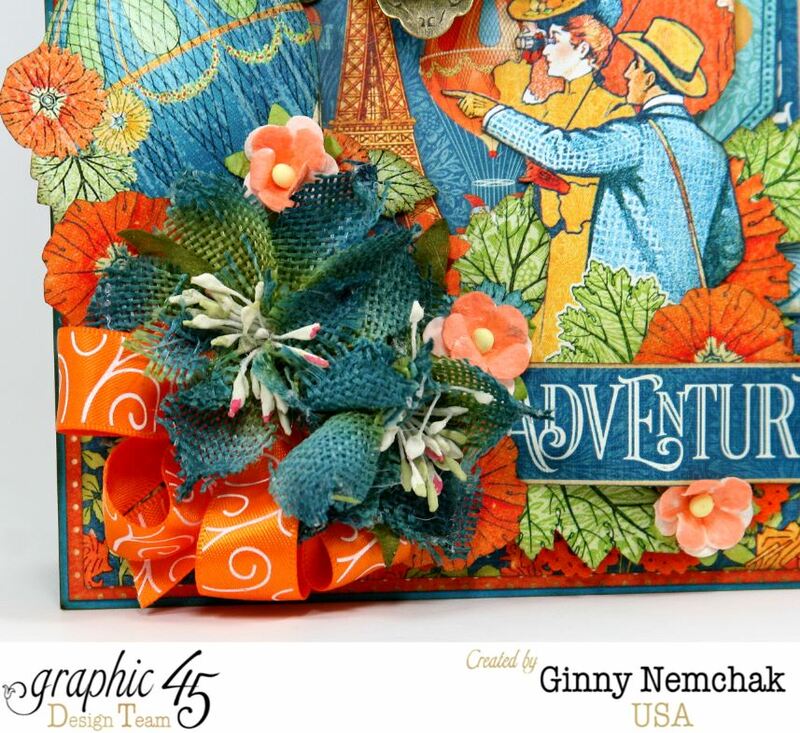 Make sure you stop by the Graphic 45 and Faber Castell Blogs to see all the other lovely projects and learn how you can be entered to win a fabulous prize. Hey there Paper Peeps! 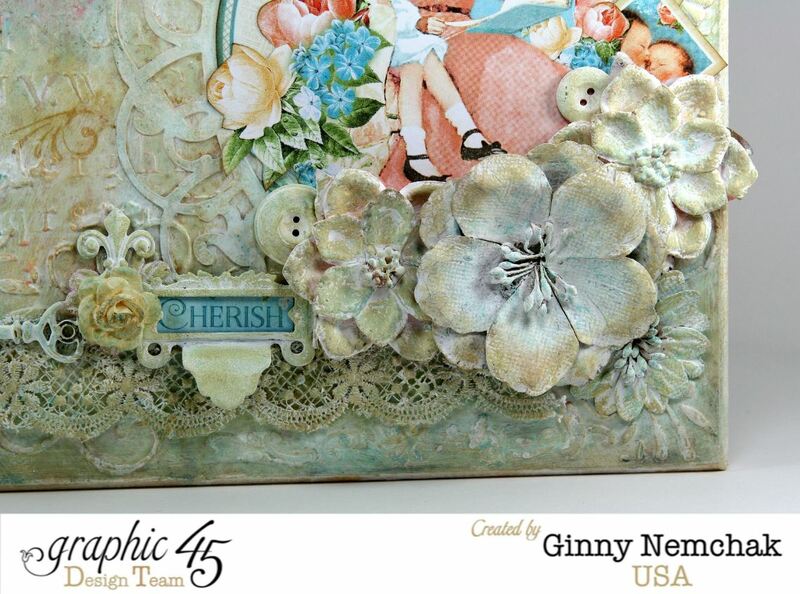 I get to share a sneak peek of the new line from Graphic 45 ~World’s Fair. What more can I say about a new collection that it’s so amazingly perfect and fabulous!!! 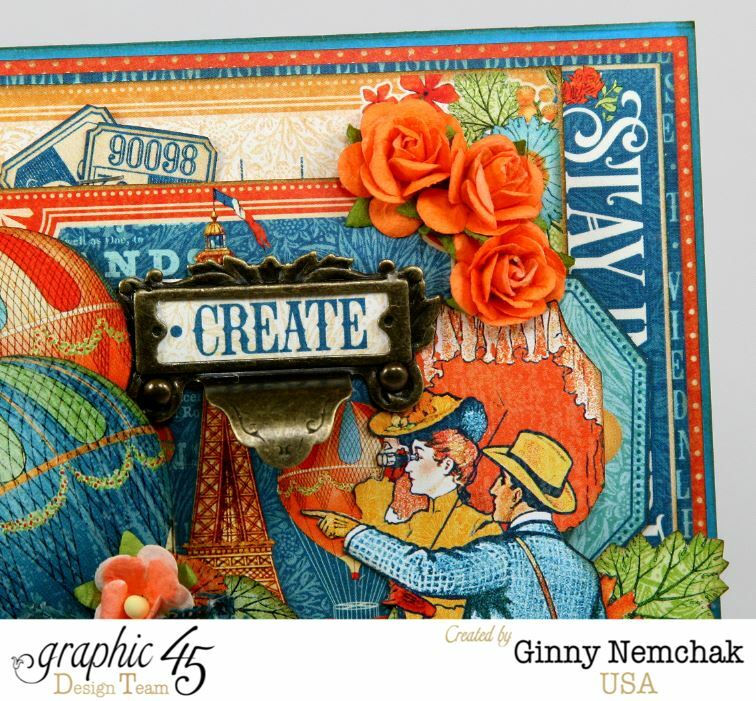 These colors were so much fun to work with and I just love the vintagy images and paper patterns! 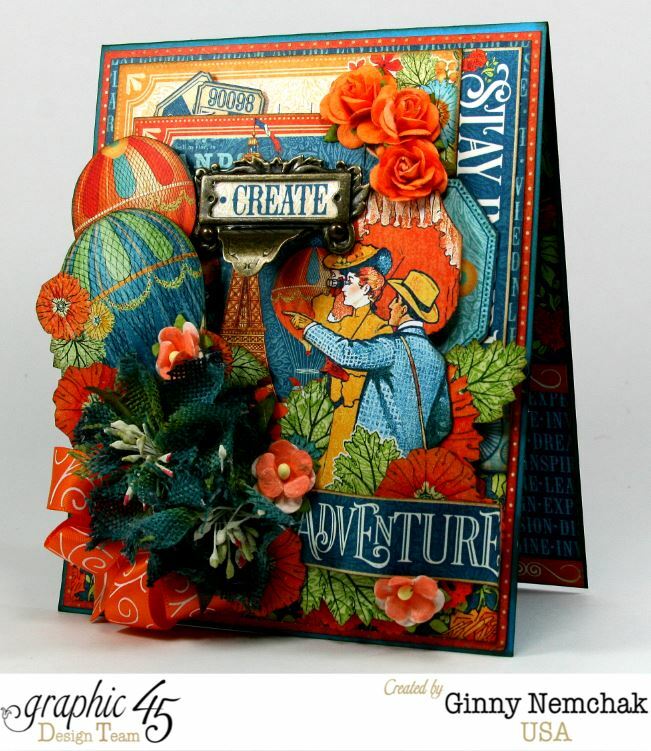 This card is my dream vacation…being fashionably dressed in Paris with my sweetie viewing hot air balloons flying around the Eiffel Tower. Maybe someday lol. 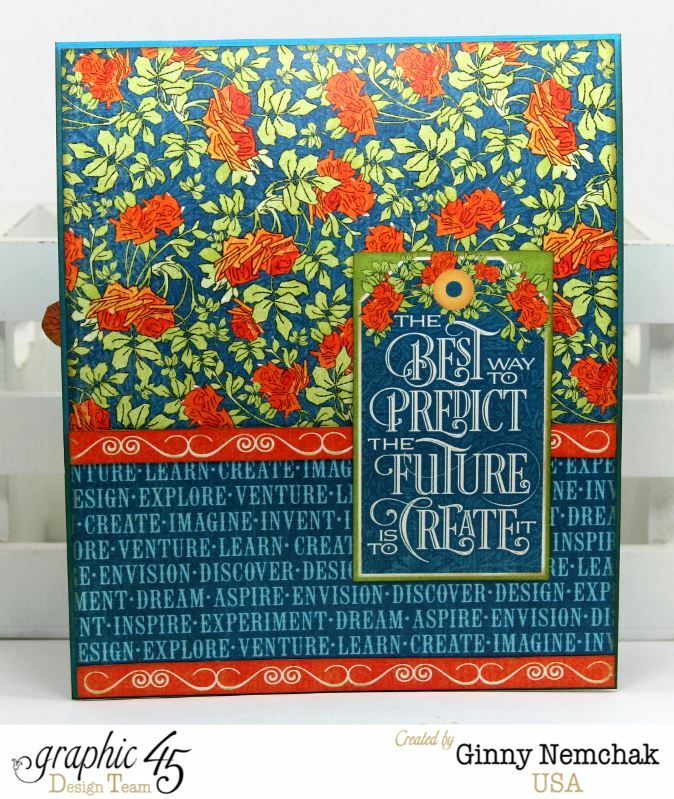 Until then I’ll have this great card to daydream with! This card is currently on display at CHA if anyone is in the neighborhood of the Graphic 45 Booth won’t you stop over and see it in person? Oh and all the other projects from the crazy awesome new lines. 66 pieces of paper goodness to get your craft on. 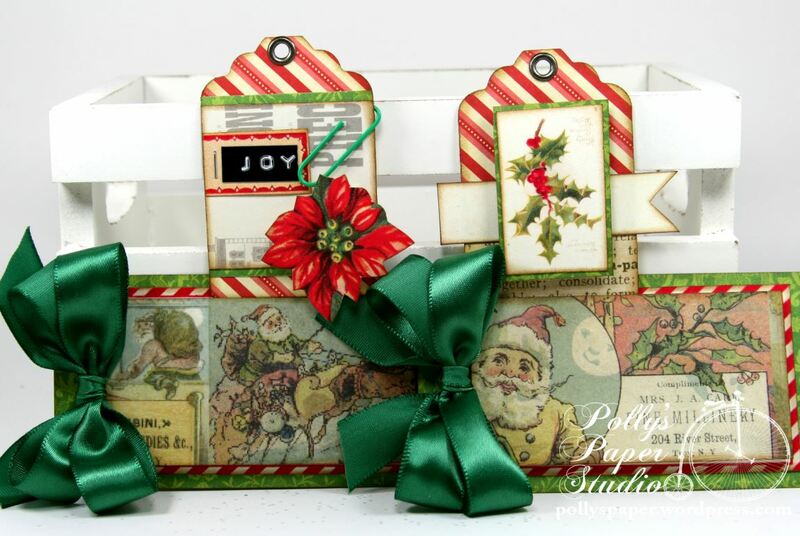 Make cards, mini albums, banners, tags, label a tasty homemade treat…..and you can see that you will get a lot of mileage out of this kit. 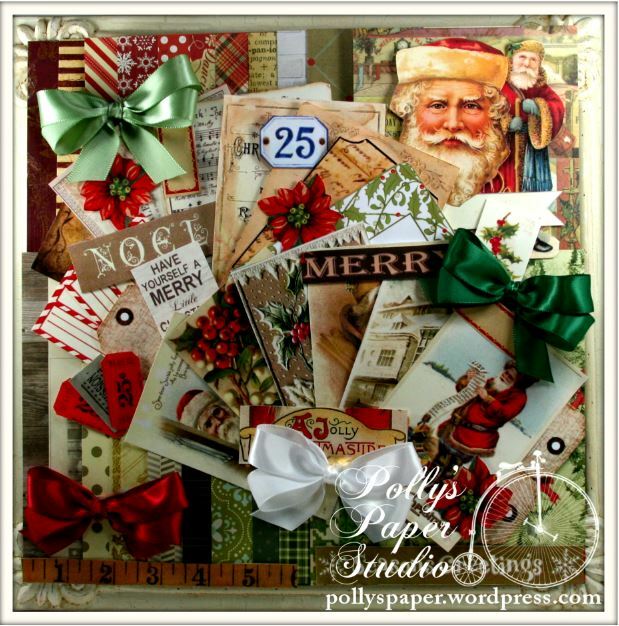 I’ve had so much fun adding richly patterned papers in warm colors and vintagy holiday images. 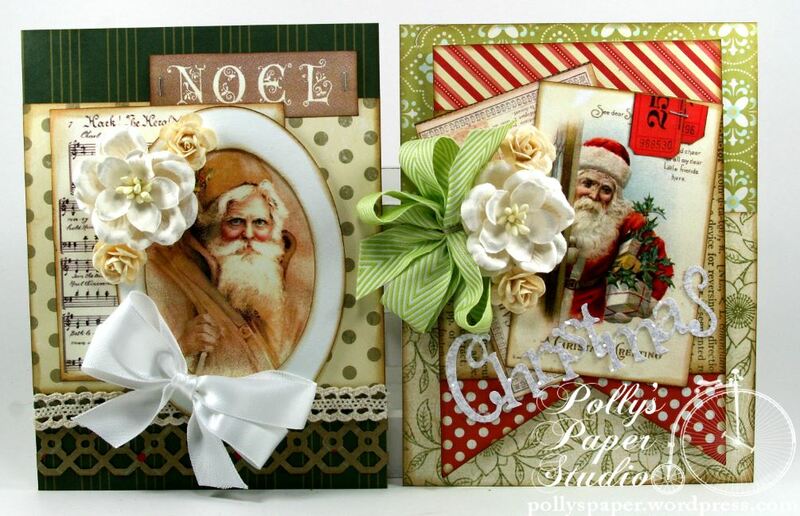 For the projects I have shown I used additional trims and embellishments from my scrap and salvage box . 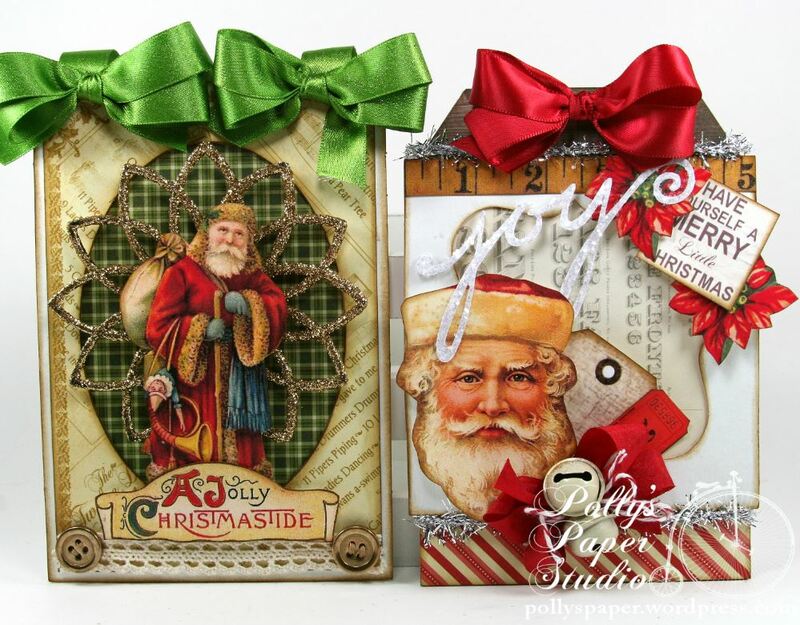 This is a great time to get a head start on your holiday crafting…why not sing Christmas carols in your tank tops and flip flops? Hey there Paper Peeps! I’m pretty excited to share my project today. We’ve been rehabbing a 1966 Vintage Banner camper for our family adventures and it’s been so much fun decorating and making up special items for it. I created a little wall hanging to go with our retro 50’s theme of white and teal like a great old fashioned diner. Isn’t this retrolicious???? 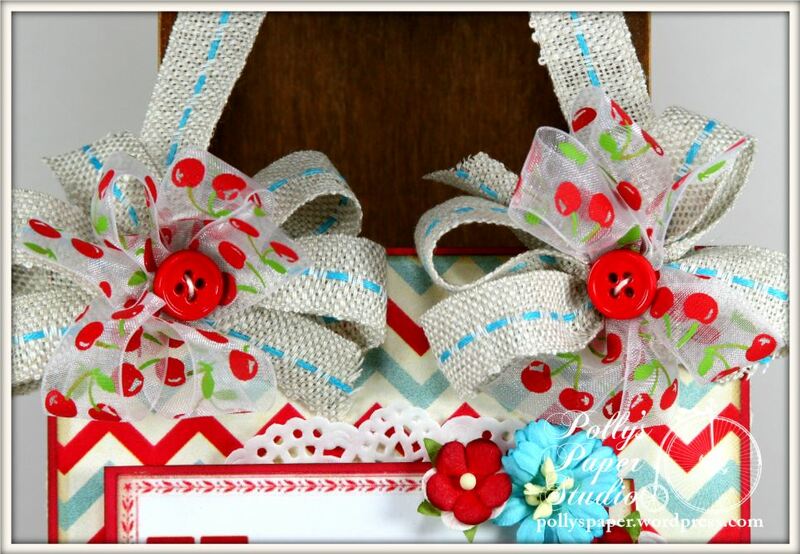 I’m using Sheer Cherry in Red and Burlap Center Stitch in Turquoise from Really Reasonable Ribbon. 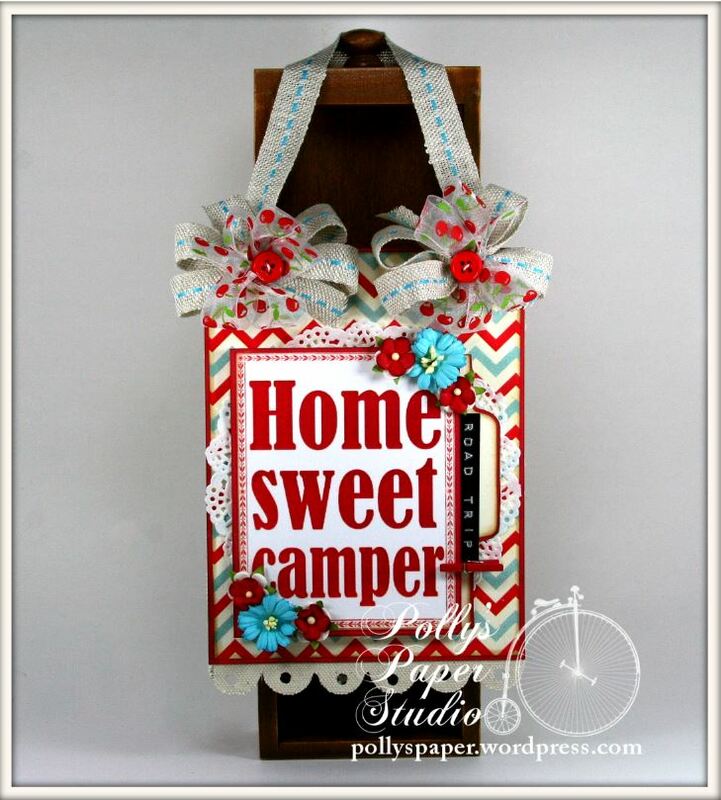 I added Red Sweetheart Blossoms and Teal Cosmos together with a funky red clothes pin and a label created with my old school label maker. 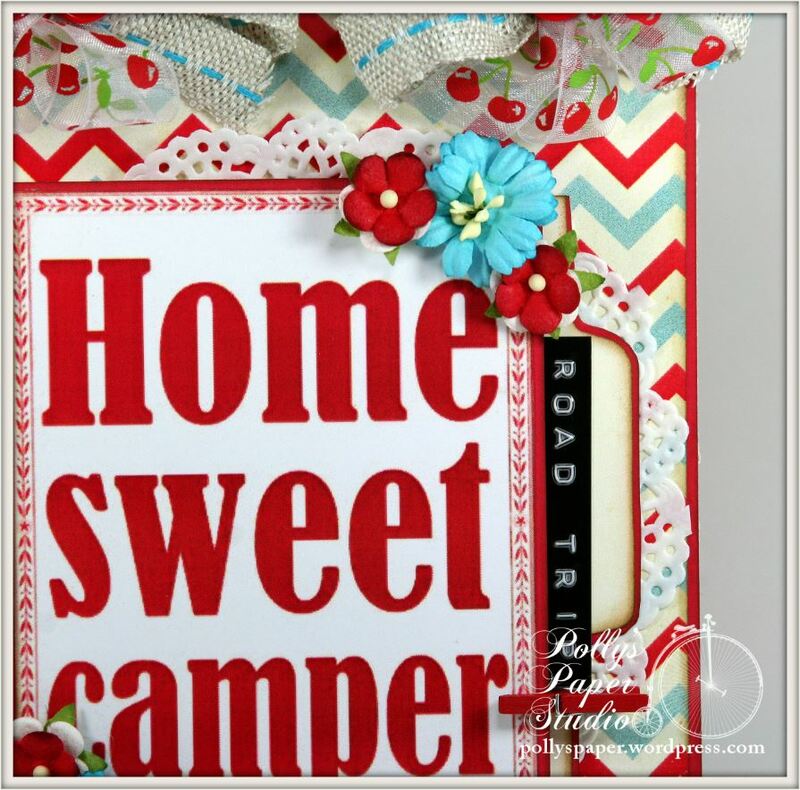 The base is super sturdy chipboard covered in canvas and it’s got a generous length of ribbon to display in our lil camper. 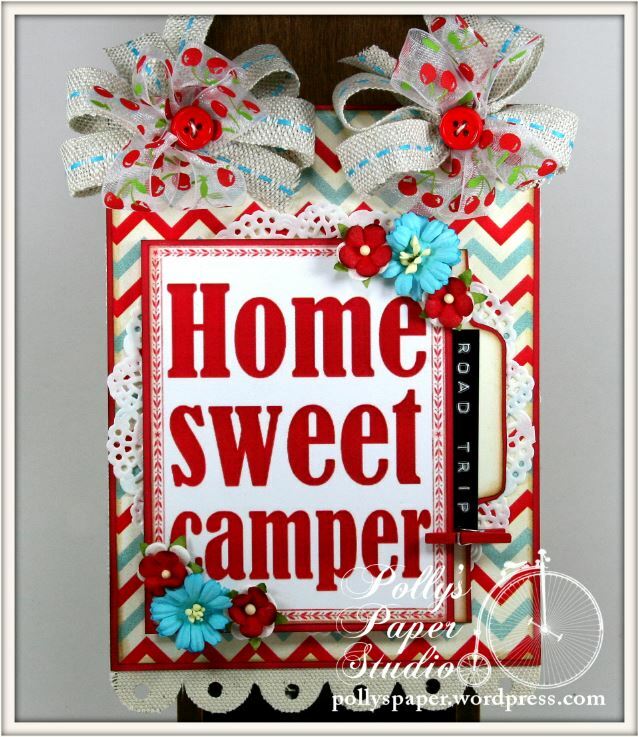 Printed paper and images from Crafty Secrets~Barber Shop, Retro Kitchen, and Creating with Retro Christmas CD I added some big chunky subway style lettering for my camper theme. Well hello there Peeps! I’ve lost tack of what day it is as my boys are still away at Philmont Boyscout Camp. Seems like they’ve been gone forever : ( I’m pretty sure it’s a weekend day though because Scooter the cat woke me up at 5 am for no reason and he never does that during the week lol. 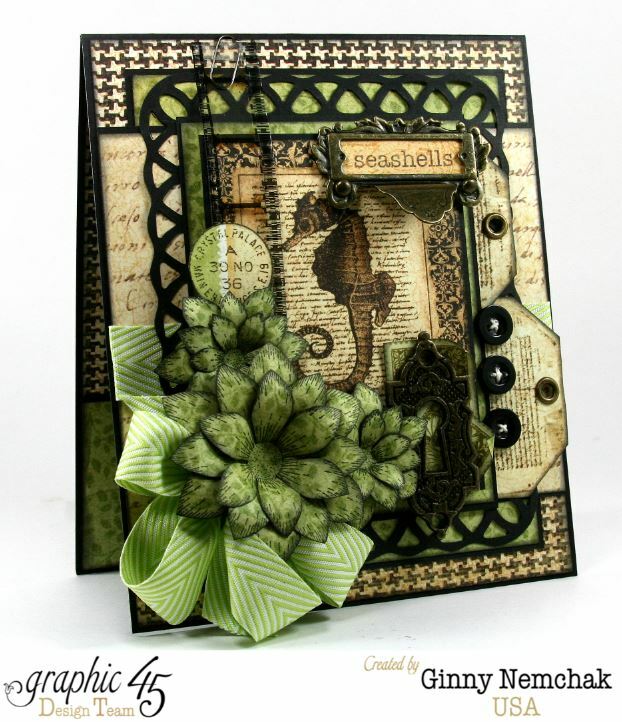 I’m dropping in with my mug of Traverse City cherry coffee to share a card I created for Crafty Secrets. Vintage Children in Window Card. 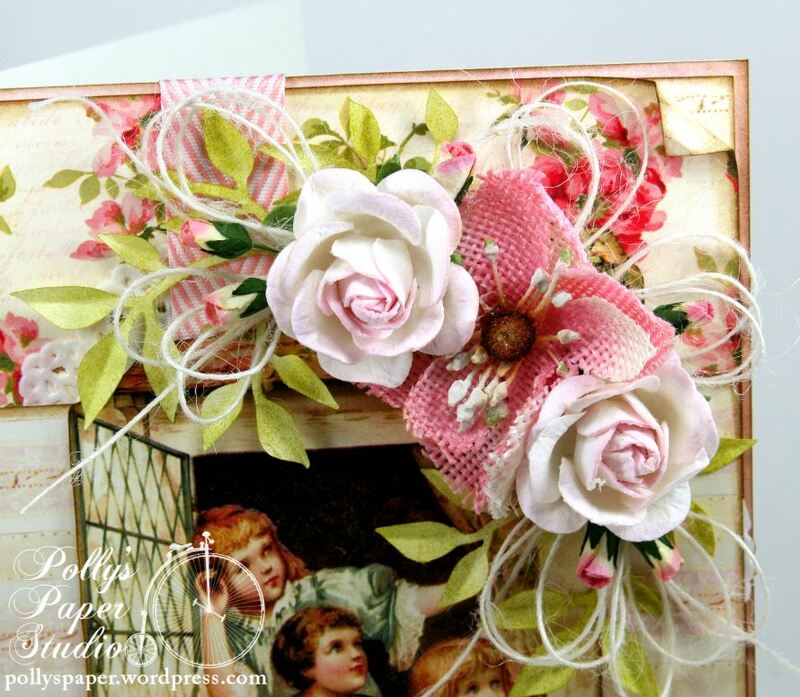 This is the shabby chicest card I’ve made in quite a while. Maybe I did…maybe I didn’t go overboard with the flowers and ribbon….but I think it’s pretty dreamy. This is a combination of Petaloo and Mulberry flowers. The leaves were cut with a Sizzix die. I’ll admit it took awhile to become friends with this particular die. I wish I could say I pick up every craft tool and am instantly an expert at it. I’ve given up on this die a few times and threw it back in the bin…but perseverance paid off and now I think I can work it successfully. I used white paper and inked it with Tim Holltz Crushed Olive Distress Ink. I added a few loopy bows of Ivory Burlap String to fill in the arrangement. 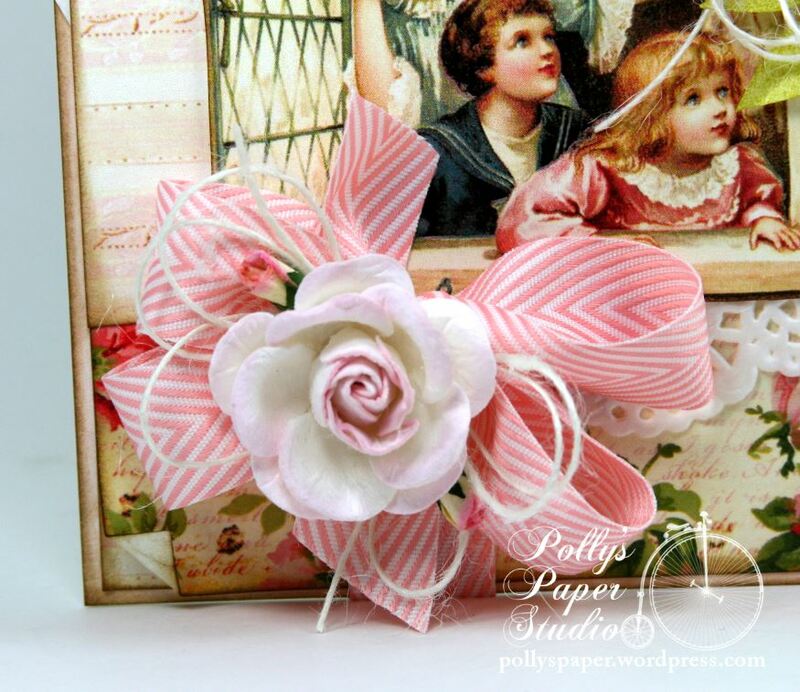 This bow is created with Pink Chevron Stripe on Twill ribbon from Really Reasonable Ribbon. Another Mulberry rose and a few tiny buds tucked in. 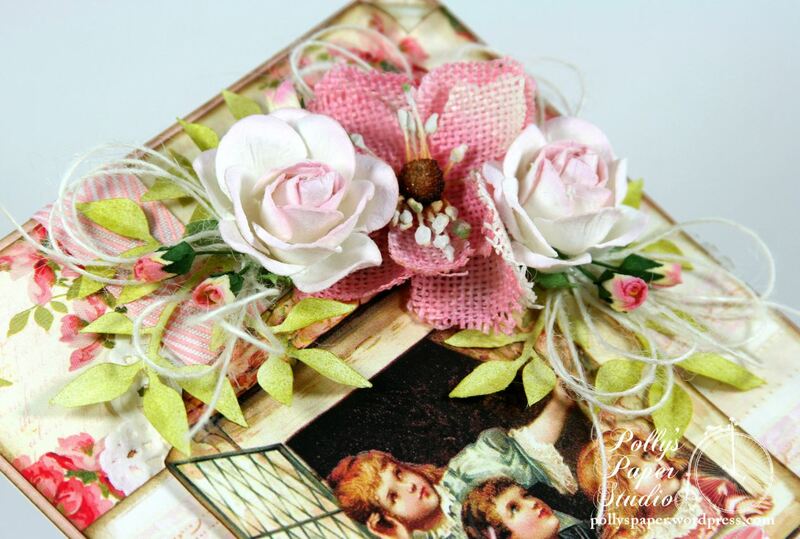 Loving the dimensional effect from all the layered flowers and trim : ) Printed papers and image are from Crafty Secrets…Wild Roses Paper, Birds and Bloom Digital Paper Kit, CD2 Creating with Vintage Illustrations. Hey Peeps! Who loves a challenge? This girl!!!! 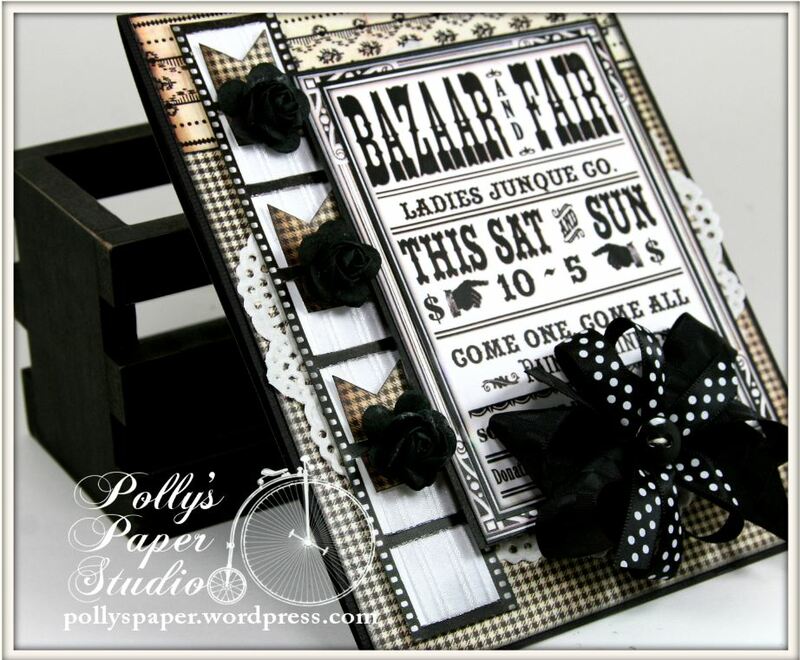 The theme for this challenge at Really Reasonable Ribbon is Black and White with 1 Additional Color. 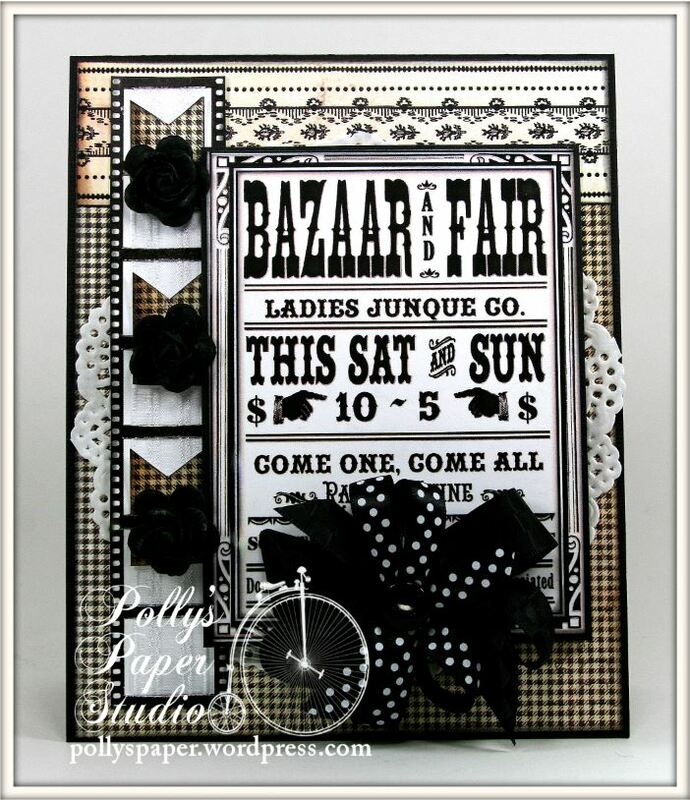 I created this fun Bazaar and Fair Card. 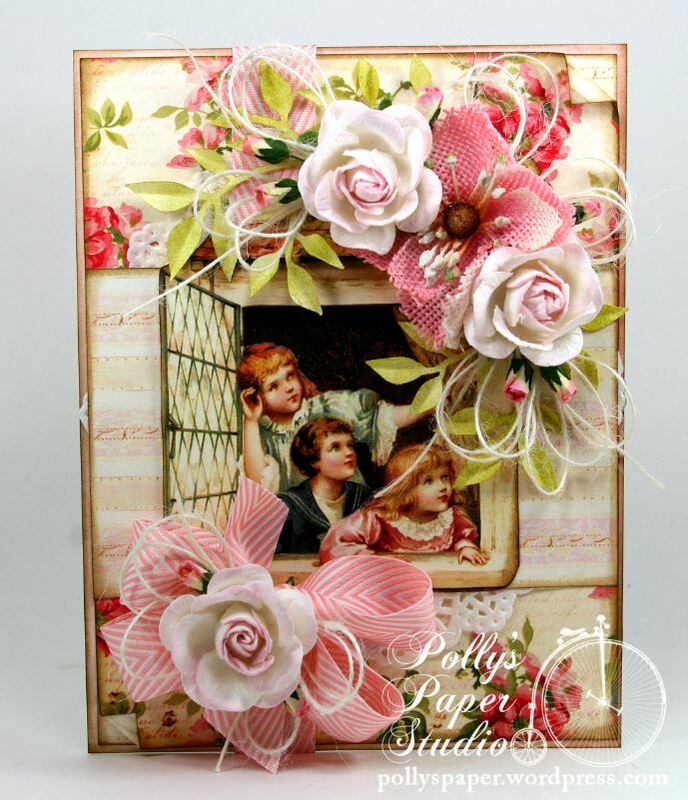 It’s a perfect all occasion card for a Birthday, Get Well, Thinking of you….pretty much everything! 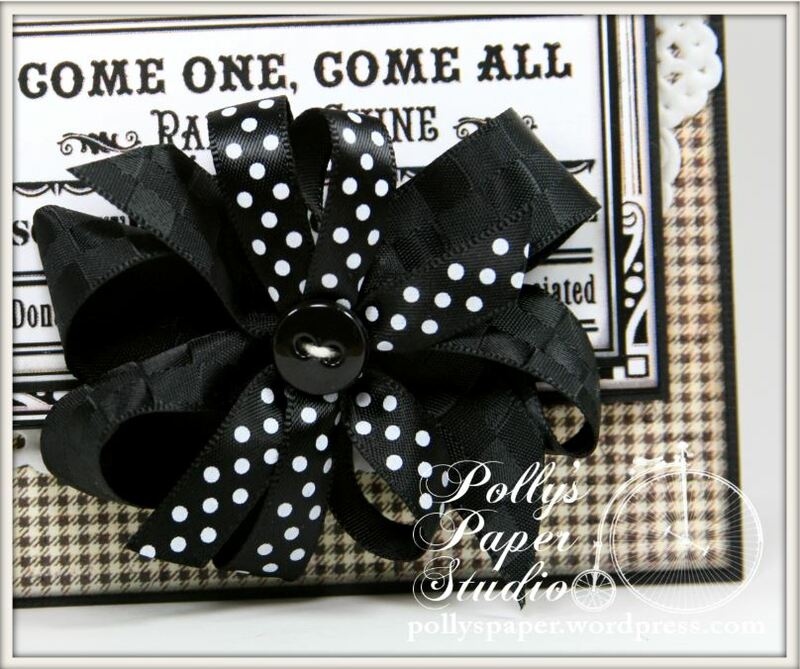 I’m using Black Checkerboard Satin and Satin Swiss Dots to make a yummy bow. 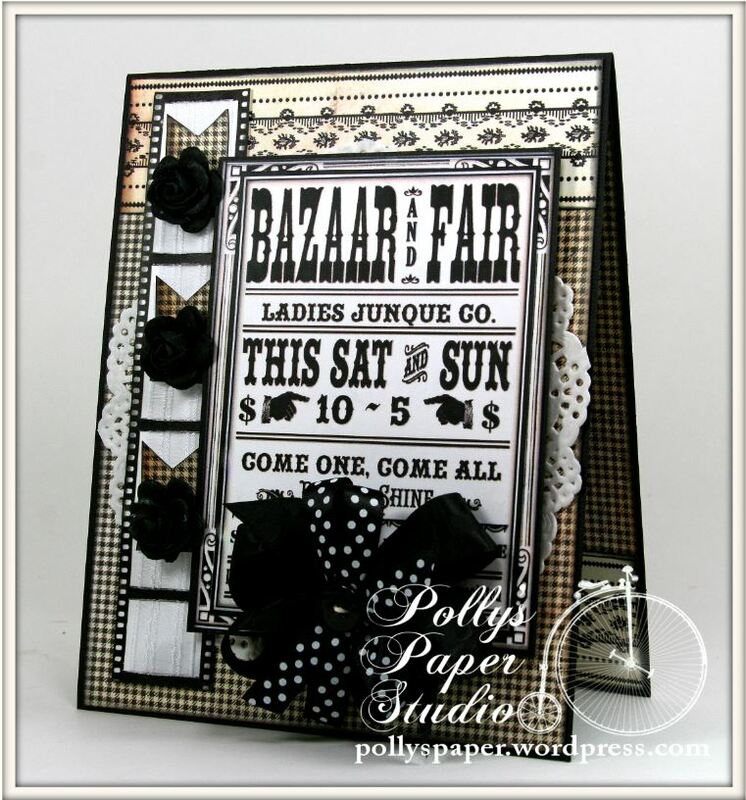 There’s also Black Mulberry Open Roses on the the filmstrip with White Sheer with 4 Thin Stripes. 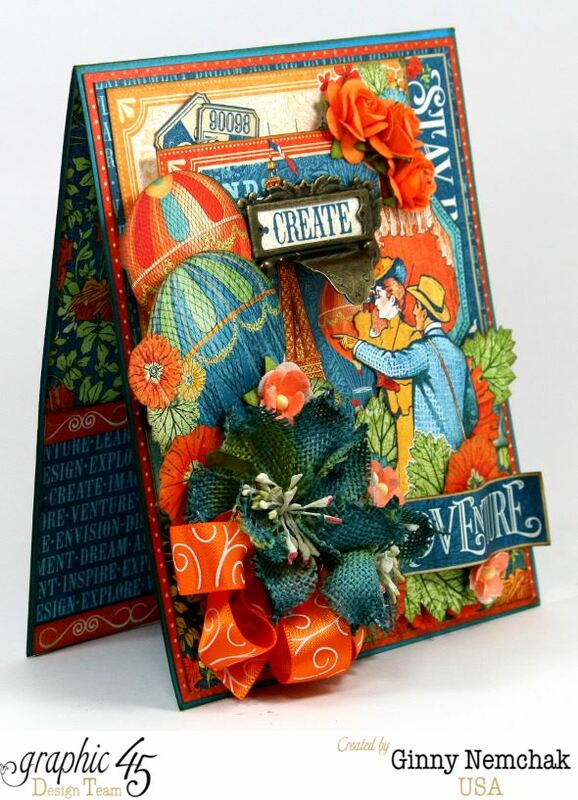 The patterned papers and vintage images are from Crafty Secrets….Digital Halloween Papers, Creating with Vintage Typography CD, Retro Kitchen Kit. Hey there Peeps. You know when you’re sooo excited that you could run around in circles? Well you can just picture me doing that when they released a Deluxe Collectors Edition of Botanicabella. One of my all time favorites!! They’ve added new cut aparts to the familiar patterns and images so it’s even better! To be honest..I actually still had some in my hoard because I couldn’t bear to use it and not have it anymore. 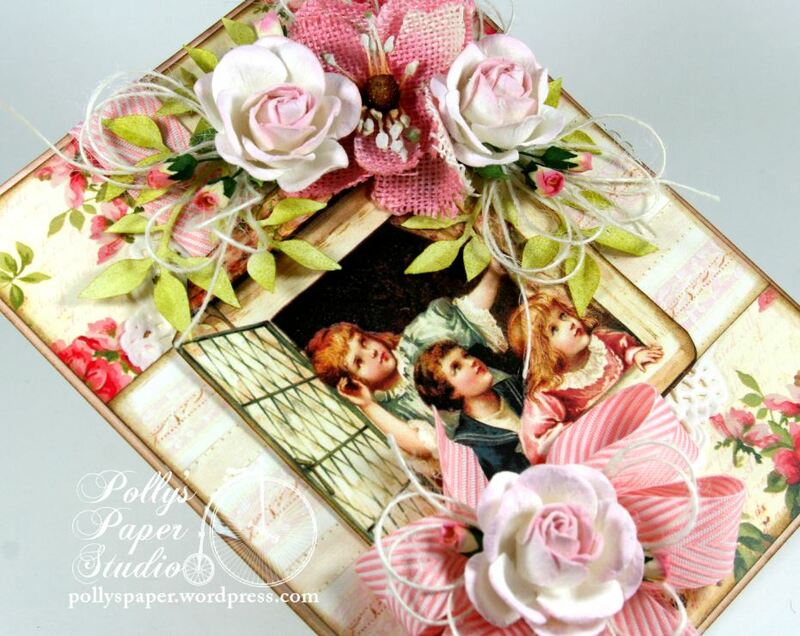 What can I say I get emotionally attached to my paper pretties. 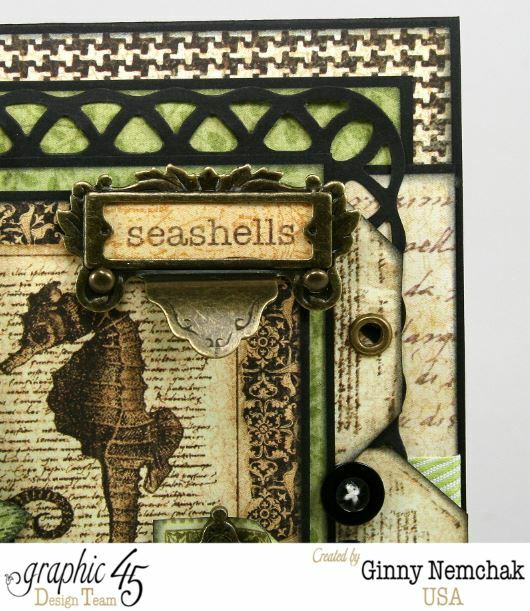 I created a card..and instead of going my usual Botanicabella plan or orange and butterflies….I went with green and seahorses….and I am swooning over this card! 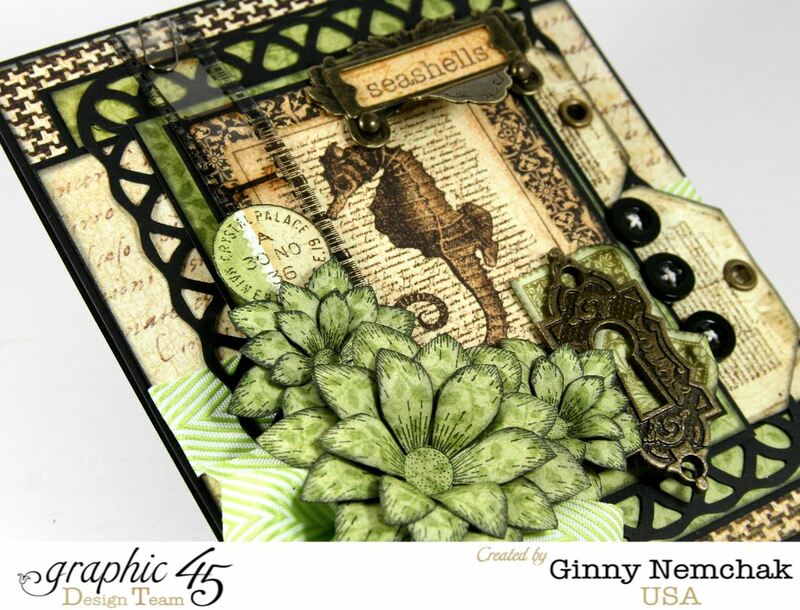 Layers and layers of Botanicabella papers and vintage image all matted with crisp black cardstock. I finished the inside with the coordinating paper patterns. 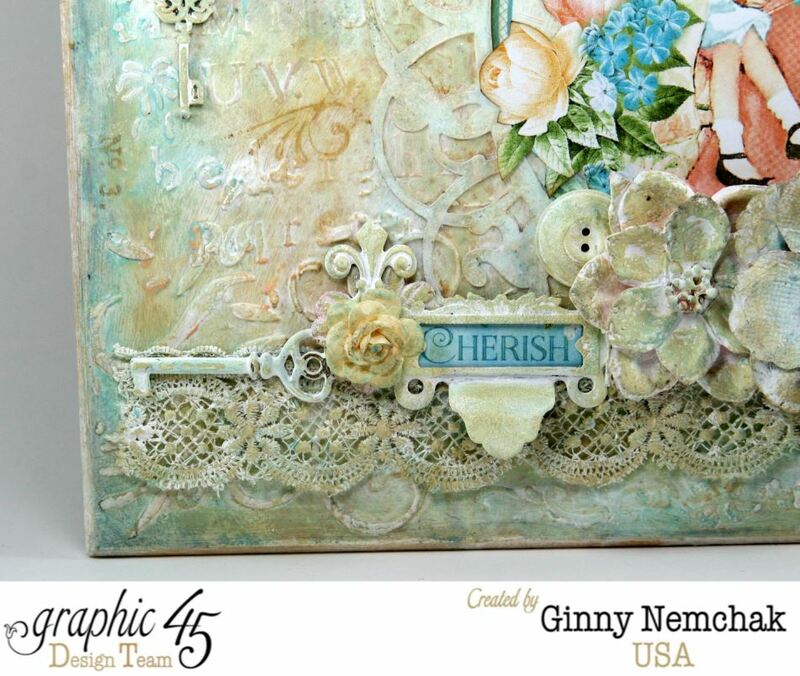 Graphic 45 Metal Staples are the perfect embellishments along with bronze eyelets, buttons, and Tim Holtz Film strip. 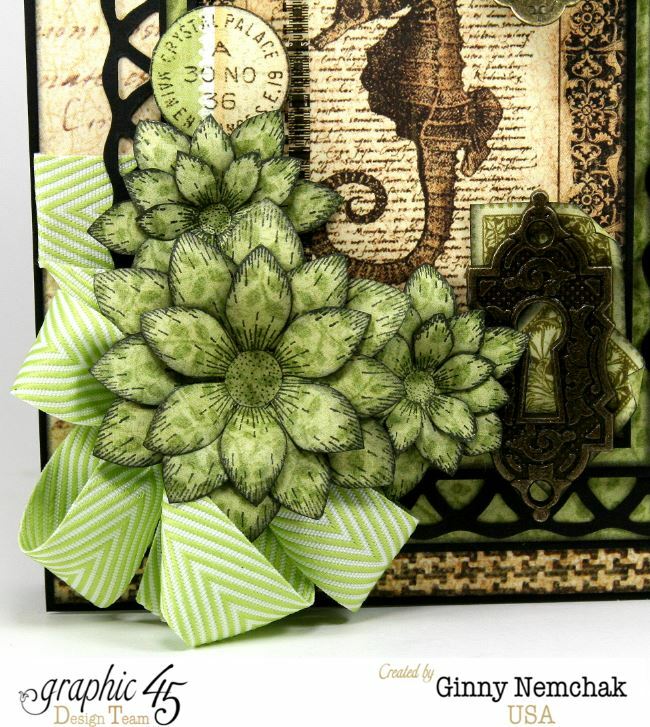 I created these flowers with a Heartfelt Creations Die and this scrumptious ribbon is Celery Chevron Stripe on Twill from Really Reasonable Ribbon.